Who doesn’t like to hear the song “Follow the Yellow Brick Road,” and see all the wonderful colors, that make up what is one of the most beloved shows ever, “The Wizard of Oz”? Your chance to see it live with Portsmouth High School students portraying the family classic is this weekend. 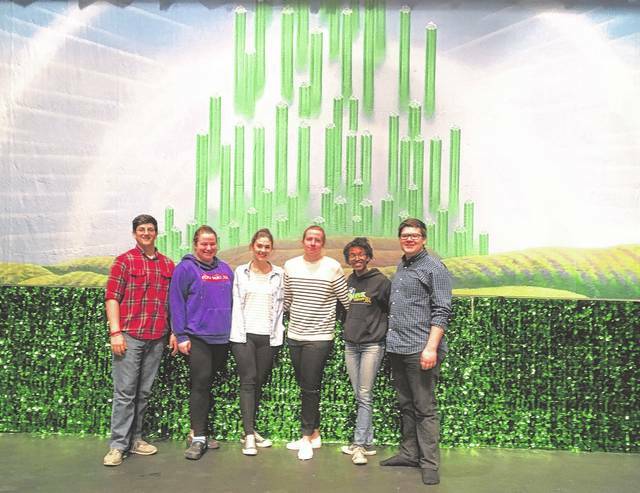 The PHS Music Department is presenting its musical play “The Wizard of Oz” Friday through Sunday at the high school cafetorium. The students are led by music teacer Emily Crandall, who has taught at Portsmouth for eight years. This is her fourth show at the high school, and she directed four at the elementary when she taught there. The shows were all musicals. The talented cast of characters showcases the talents of Adrian Soard as the Tin Man; Katie Fannin in the part of Glinda, the Good Witch of the South; Zachary Kinney as the Cowardly Lion; Hanah Martin playing the Wicked Witch of the West; Sarah Simmons portraying Dorothy; and Micah Simmons as the Scarecrow. All the characters are played by seniors, except for Martin, who is a sophomore. Soard says of his part, “I have the solo, ‘If I Only Had a Heart’.” He has played parts before, but this is his first major one with a solo. He says he is very excited to do this. Fannin says that she, too, has played other parts, but this is her first lead part. She will be singing two solos. When asked if she is ready, she laughingly replied, “I hope so,” but added “I’ll probably be nervous. I think playing Glinda will be fun. I’ve enjoyed it so far.” She also plays Aunt Em at the beginning of the show. Kinney says he is excited to play the Cowardly Lion, and has played a lead before. He has two solos to sing, and his costume is a rented one, rather than made by someone. Micah Simmons, portraying the Scarecrow, he has a solo, and has had one before. He also admits that he gets nervous. “Once you get in front of a crowd, it’s like, this is not bad at all, and you kinda go with that,” he says. Crandall outlined the timeline leading up to this weekend’s performances. “We auditioned in December, and we started rehearsing after Christmas break.” The students said they practice every evening after school, plus each one said they are involved with other activities as well. That takes a great amount of time and energy, but they are committed to the dedication and responsibility necessary. They all say they get along really well, which helps a lot when rehearsing. The students all have aspirations for their future, especially since all but one will be graduating in May. Soard wants to go into vocal music education; Fannin plans to go into secondary education; Kinney is planning on becoming a nurse; Sarah Simmons wants to go into theater, either theatre design, set design or performance; Martin already has plans to go into musical theater; and Micah Simmons plans on going to Baldwin Wallace University in Berea pursuing a double major in music education and film studies. 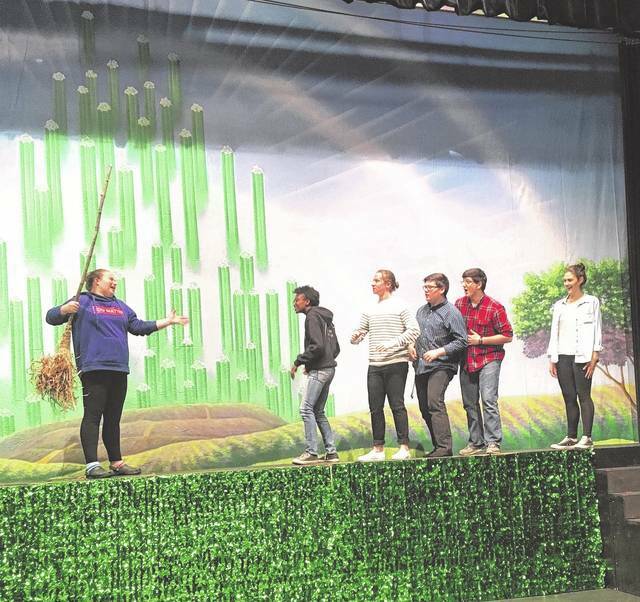 “The Wizard of Oz” has five performances — two at the elementary school Friday afternoon, then Friday and Saturday night, and Sunday afternoon. All the students say they have family members coming to watch their performances. They did say that puts more pressure on them, and one of them chimed in with “100 percent!” All of them say they are looking forward to the play and getting dressed up for their parts. Crandall said all of the students are going to New York City in two weeks, along with the rest of the Competitive Show Choir, which is also in the musical. It will be a much-deserved trip after all they have put into this show. Ironically, with March being considered the beginning of tornado season, what better choice than a production in which a twister plays a pivotal role. Everyone is welcome to attend this weekend’s performances of a very kid-friendly rendition of an old-time favorite. Not only is it a show sure to please, but also showcases the talents of our local students.